Great day today in the rain. I fished with Larry Richards from the St. louis area. We only boated 6 browns but we had two big ones . The biggest was 9lbs.15ozs. We started the day off at Gastons. The water was low and projected to stay that way. I've been drifting minnows on the low water just like I do when its running. I was thinking that the rainy day would have the fish biting but not so much until around 11am. 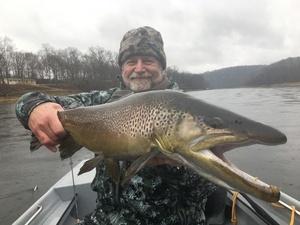 We had boated 4 browns and a few rainbows when Larry hooked a really nice brown at the lower end of the blue hole.We took a quick pic and let it go. On the very next cast Larry hooked a great fish that took several minutes just to get a look at and several more to put the gator head brown trout in the net. It was 9 pounds 15 ounces. Only one oz. shy of the fish his wife landed with me last summer. We decided to get out of the rain and call it a day after releasing the big male back to the White River.